A Lizard Lab update is long overdue! The lab has had the pleasure of hosting Stephan Leu as a visiting postdoc. Stephan and Martin have been working on a paper together and planning upcoming research on blueys (social networks) and sleepy lizards (with Mike Bull). Stephan has done some fantastic work on social networks in sleepy lizards. Our previous visiting postdoc, Dr. Qi Yin, returned to China in December and is sorely missed although Martin and Dan will be visiting him in June. In September the lab will host Renata Kopena, a visiting PhD student from Jose Martin’s lab at the National Museum of Natural History in Madrid. 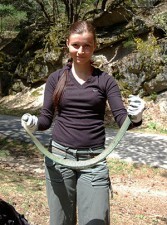 Renata will be working on water dragons with Martin and Dani. For the upcoming field season we will also be joined by a small army of interns from France and Germany. Patricio Lagos (PhD student) has also joined the lab, although he will be working primarily with Mariella Herberstein but with some help from Martin. Patricio will be studying predator-prey relationships. 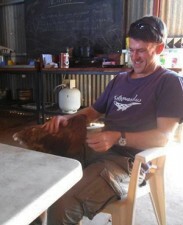 Jonno Love (MSc student) has also joined the lab, although he will be working with on fowl with K-lynn Smith. (We seem to be branching out to non-scaled reptiles!) The lab has also recruited two new honours students. Ben Clark is well on his way with his project on cognition in skinks that have been incubated at high and low temperatures (in collaboration with Josh Amiel and Rick Shine, Sydney Uni.). And Grant Webster will be working on colour change and signalling in the frog Litoria revelata. And in the most significant lab news to date, Mitch Scott has wrapped up his honours in great style. Mitch generated some amazing data and its just a matter of days before the next drafts of his various papers hit the desks of his three supervisors. Mitch has also just written a blog about his project and he is waiting patiently for Martin to post it. The censorship process appears to be the major constraint. The rest of the lab has been busy too. Dan has recently submitted two papers, while Dani, Alana and Marco are all working on various papers and Siobhan has just returned from a successful field season at Newhaven AWC, in the Tanamai Desert (or pretty damn close to it!). Martin and Adam Stow recently visited her at her field site (photos below). Siobhan will also soon be posting an update on her field experience including the fact that she lost count of the number of thorny devils she saw. Finally, our lab manager, Sally Whiting, just barely survived a suspected snake bite and spent a week recovering in hospital. She had a very close call but is now making a speedy recovery. That’s about all we have for now..
Little Quartzie. We made Quartzie an honorary lab member. She liked to join us for breakfast. Siobhan and John + thorny. Spencer the goanna. Spencer was also made an honorary lab member. Spencer lives in Alice Springs.